We do urge everyone to check out the new grooves. The first MOL album is a work in progress, however you can catch a sneak preview on youtube. MOL has a myspace page, and describes it’s new sound as down-tempo, dub and elctronica. No doubt there will be some harmonica in there somewhere. There is also a Facebook page and a dedicated website in the pipeline. 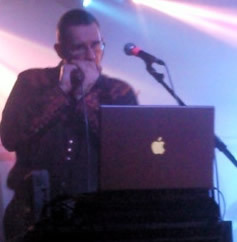 Harp Surgery had the great pleasure of interviewing Piers when Alabama 3 played in Brighton at the end of 2008. He was endearingly embarrassed to be an interviewee. Pointing a finger at the front men as they ghosted by, ‘they usually get all the attention’, he quipped. He is engaging, open and instantly likable. I could have been chatting to an old school mate I hadn’t seen for years. One who had attracted the media spotlight, reveled in the creative experience, but remained unerringly normal. The word ‘grounded’ springs to mind. We also enquired as to the origins of the pseudonym. Piers told us the name had been given to him and was taken from an old country or gospel song. The track has been covered by many artists, including the Beach Boys and Bruce Springsteen. Anyway, now you’ve booked your ticket to see Mountain Of Love, let’s see what else we can find out about that song. See you at the gig. The 1964 Johnny Rivers version of Mountain Of Love, with its hint of Louisiana, was always going to be the one that caught the Harp Surgery’s ear. It has a healthy old dollop of the old lickin’ stick aftr all. But although Johnny dabbled in the harp, he drafted in former Sun Records rockabilly artist Billy Lee ‘Red Hot’ Riley to lay down the harmonica sequence on his hit single. Billy Lee Riley’s harp playing can be heard on the following albums: Harmonica & the Blues, Crown, 1962 / Big Harmonica Special, Mercury, 1964 / Harmonica Beatlemania, Mercury, 1965. ← Harp The Herald Angels Sing! Carlos! Glad you made it and thanks for your feedback. Afraid I was away working so didn’t get to the show. Looking forward to catching them very soon. Piers is a really top geezer. Hi Steven – I’ll add it to the list! You are on a our ‘to do’ list! We assure you that this will be attended to as soon as we can free up some time. Thanks for your patience. notes and each phrase ends on a blow on 3.
you should be able to work out most of the song.